Left to right: Mathew Cherukara, Ali Erdemir, Badri Narayanan, Alexander Zinovev, Anirudha Sumant and Subramanian Sankaranarayanan. Photo: Argonne National Laboratory. By combining nanodiamonds with two-dimensional (2D) molybdenum disulfide layers and then breaking them, researchers at the US Department of Energy's (DOE) Argonne National Laboratory have created a self-generating, very-low-friction dry lubricant that lasts so long it could almost be confused with forever. This material could have hundreds of industrial applications, able to be used wherever two pieces of metal rub together in dry conditions. The most commonly used solid lubricants on the market today take the form of graphite paste, which is used to grease doorknobs and bike chains, among other things. In 2015, Anirudha Sumant of the Nanoscience and Technology division at Argonne and his colleagues achieved a breakthrough in solid lubrication technology by demonstrating superlubricity (near-zero friction) at engineering scale for the first time by using graphene combined with nanodiamonds. This approach was revolutionary, and since then his group has continued to develop the technology. Most recently, Sumant replaced the graphene with molybdenum disulfide to see how other 2D materials would behave. He was expecting the resultant material to resemble the graphene-nanodiamond lubricant, and so was surprised when Diana Berman, the lead author and Argonne post-doctoral fellow, didn’t see any nanodiamonds in the material. Instead, she found balls of onion-like carbon. What was happening? It turns out that the molybdenum disulfide was breaking up into molybdenum and sulfur and reacting with the nanodiamonds to convert them into onion-like carbon. "We knew that the culprit must be sulfur damaging the nanodiamonds, but for us it actually helps," Sumant said. 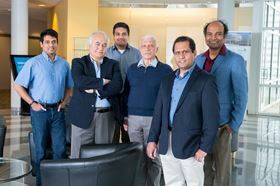 The Argonne team, which included Sumant, Diana Berman, Subramanian Sankaranarayanan, Badri Narayanan, Mathew Cherukara, Ali Erdemir and Alexander Zinovev, realized that sulfur diffusion was increasing the strain in the nanodiamonds, subsequently breaking them and converting them into onion-like carbon. The friction experienced by this new combination is 10 times lower than that of some non-stick coatings including fluoropolymers, which means less heat and less wear and tear on parts and equipment. John Harvey, business development executive at Argonne, said he's already had a significant amount of industry interest in the technology, even though a paper on this work was only recently published in Nature Communications. "The material the lubricant is used on is going to last longer, and I don't have to worry about liquid residue and throwing out oily rags as part of the clean-up process," Harvey said. "We also can use it to make parts that we can't make today, especially with metal stamping." Onion-like carbon, when formed, consists of several layers of spherical graphitic shells that can be used as a dry lubricant. And the process of sprinkling molybdenum disulfide and nanodiamonds together creates this form of carbon automatically, without any additional chemical application. "It's interesting to see that these carbon balls can sustain high contact pressure and, due to their unique nanostructure, can glide easily, creating the superlubricity," said Ali Erdemir, Argonne distinguished fellow and a collaborator in this study. "We have now figured out how to generate lubricants during sliding that can last much longer than any other solid lubricants," Sumant said. While molybdenum disulfide is a bit more expensive than graphene, less is needed. "The amount is so small – a few drops for kilometers of sliding – that cost is not an issue," Sumant said. The dry lubrication method is also much cleaner because no hazardous chemicals are thrown away during the process, he added. Dry lubricants are already common in several industries, but they are mostly used for thin-film coatings and are prone to catastrophic failure modes. The Argonne-developed superlubricant works very differently from traditional thin-film coatings, readjusting itself continuously and so lasting longer. "This really represents the next generation of solid lubricant," Sumant said. Potential applications include bearings and mechanical pump seals in dry applications, as well as in wind turbines. The technology could also be used in the computer industry, especially in magnetic disc drives. Carbodeon Ltd Oy has developed a plastic material incorporating nanodiamond particles for use in additive manufacturing (AM). Nanodiamond material specialist Carbodeon has developed an electroless nickel, PTFE and nanodiamond composite coating.